Two years ago, my husband and I were browsing the book section of a card store called Rainbows and Triangles in Chelsea. They used to have an amazing selection. We loved to go there to discover LGBT books you wouldn’t necessarily find on the shelves of more commercial stores like Barnes & Noble. They still have a decent selection, but they reorganized the store about a year ago and shrank the book department considerably. Even the card section got downsized. But I digress. 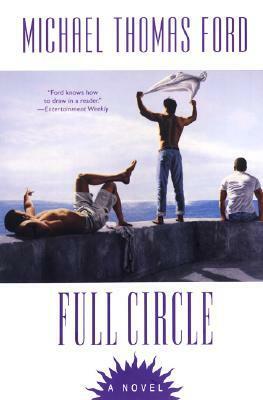 On that day two years ago we happened upon a book called Full Circle by Michael Thomas Ford. I’m not ashamed to admit that what first drew us to the book was the cover. We have a painting by Steve Walker that hangs in our bedroom, so we immediately recognized the artist used on Ford’s books. After reading the blurb on the back we were both intrigued and picked up a copy. I can’t remember who started reading it first, but we ended up trying to read it at the same time, prompting a second trip to Rainbows and Triangles to get another copy. We feel very fortunate to have stumbled upon it and have been recommending it ever since. 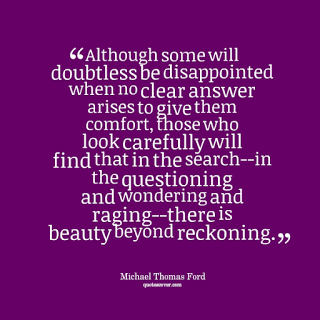 That holiday season I took on a second job at Barnes & Noble and looked Michael Thomas Ford up. None of his LGBT books exist if you look him up in their computer. The only one they can find is a YA book he wrote. This, to me, is a perfect example of how gay lit can get ghettoized in stores. It’s a fantastic book, but because it deals with gay characters and modern gay history, commercial bookstores don’t know what to do with it. It’s a shame. Ned Brummel, a history professor living in Maine with his partner of 12 years, is sent on a trip down memory lane when he receives word that an old friend is dying. While Ned travels to Chicago to be by his friend’s bedside we are taken through his life story. Ned’s profession is not an accident, as he will prove to be an excellent guide through a tumultuous time period. Born in 1950, Ned is an accidental witness to a wildly active period in gay history. He comes of age at the same time that the Stonewall riots occur, spends a tour in Vietnam, navigates the minefield of the AIDS crisis, witnesses the era of Don’t Ask Don’t Tell, and settles into the modern age of It Gets Better. It’s like a primer on gay history for the last sixty years, which has proven to be a fascinating time of hardship and strife, but also of progress and change. Any gay man wanting to know what it was like to live as a gay man in the latter half of the 20th century would do well to pick up this novel. But this isn’t a mere history lesson, so don’t be daunted. Ned’s life brushes with historical events in a manner similar to Forrest Gump, without so much of the cloying. One of my big pet peeves is when an author tries so desperately hard to contrive a way for his or her characters to be present at every significant event during a certain time period. For the most part, Ford makes it seem natural. It helps that some of the period details are merely hinted at. Ned sees a brassy singer performing in a bathhouse and speculates that she’s got a big future. The lady in question is never named, but it seems clear that he means Bette Midler. These moments are fun. There are, however, some that don’t work. Like when Ned and his friend Jack remark that Gloria Vanderbuilt’s six-year old son Anderson Cooper is clearly gay. That’s a touch too prescient (and a bit of an eye-roll). Is it a perfect novel? No. It has flaws. But it’s a sweet story and well-told. It deserves to be read and experienced. For more LGBT book recommendations visit my LGBT Books page.